The Samsung Galaxy S6 and S6 Edge are being put through their paces lately ahead of launch day in bend tests and different comparisons, but what about its durability? Unsurprisingly, the Galaxy S6 Edge has been put through some truly brutal tests, though the results were more than surprising. Head over the jump and be prepared to be awestruck. As the 10th of April draws near, more and more YouTubers seem to have grabbed their share of the S6 and S6 Edge test units. With such videos starting to hit the video streaming site, two have really caught our attention of the Galaxy S6 Edge. One being a test of the phone’s durability under water, and another of an utterly brutal attack on the phone’s front glass panel. With a metal and glass construction this time around, Samsung has literally stepped out of its skin with a built-in (non-removable) battery, and has even dropped the waterproofing capabilities found in the S5. With the S6 and S6 Edge not being so strong in that department anymore, TechSmartt decided to check out exactly how the device would fare underwater. 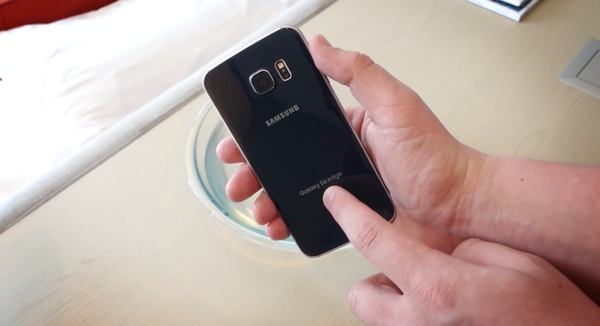 The guy submerged his Galaxy S6 Edge unit in a bowl of water with the stopwatch running, and what followed next was simply astonishing; the device was able fight it out for over 23 minutes until it started acting funny. You can check out the video in detail. So while the S6 or the S6 Edge still may not be waterproof per say, there is a high probability that accidental drops in puddles or sinks won’t matter much and your phone will be safe. But still, we won’t recommend that you perform such a feat as Samsung doesn’t guarantee anything for this and it’s also not covered under warranty. The second video will literally make you cringe for a second or two; it’s that noise of the Galaxy S6 Edge hitting the floor face first with full force, not once, but twice! This is not your regular standardized drop test that you have seen for your favorite phones, where there’s an effort put to replicate real-use scenarios. This overenthusiastic tester decided to simply smash the phone face first into concrete with full force, and say what you may but it proves a point. The glass comes out unscathed on the S6 Edge. What are you talking about moron? At 240p it was hard to tell the state of the screen after the drop test. But still, it was working! And not to be too pedantic, but it was thrown three times, not twice. That second throw was vicious also. Straight on its face, hard. Redmond pie blocked my video so you can’t watch it, there’s a version in HD of this video. Google it! This phone is insane. By the way, the screen was intact. They are just hating.